Welcome to another Thrift Store Challenge post!! 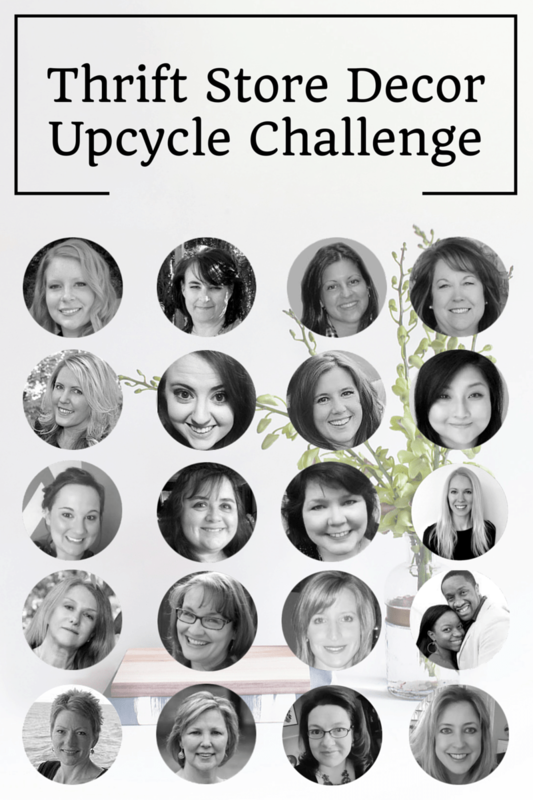 If you remember, I’ve paired up with 20 other talented ladies to bring you a monthly Thrift Store Decor Upcycle Challenge. Each month we will create a new home decor piece from an item(s) we’ve found at a thrift store, yard sale, resale shop etc. There is no budget or specific theme so we are free to let our creativity run wild! 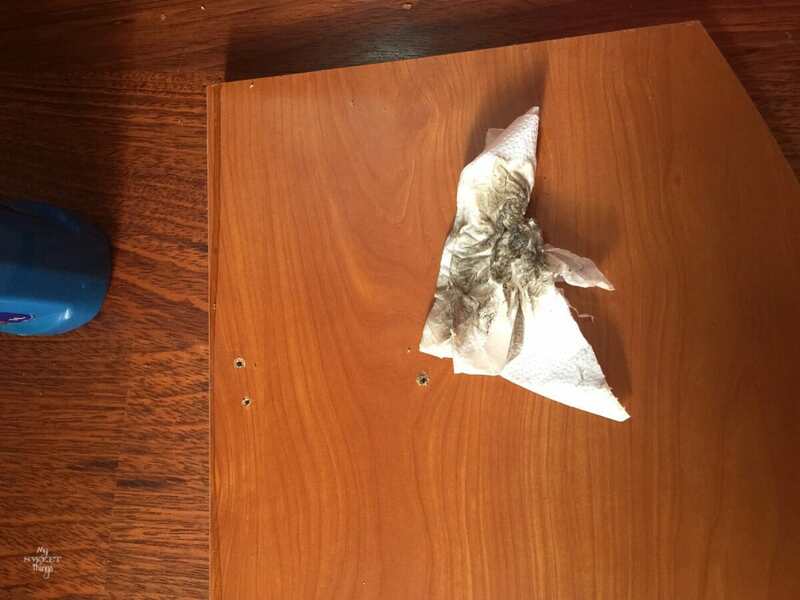 Last month I showed you our play kitchen makeover and the previous one my pretty side table. Last week I was exploring our new town and I found a little thrift store. I have enough stuff at home to run a thrift store on my own, but I couldn’t help going inside and have a look. The lady who works there was really nice and we chat for a while, and then she said I could have a look around and ask her if I needed any help. There were lots of things I would have loved buying, but after our recent move and all the work it meant I sworn to myself not to buy more that one thing each time. Sooo, I found this shelf with the metal brackets still on and thought I could make something from it. The first thing I did was cleaning it. It’s not that I’m obsessed with cleaning, it’s because it was filthy. Judge for yourselves. 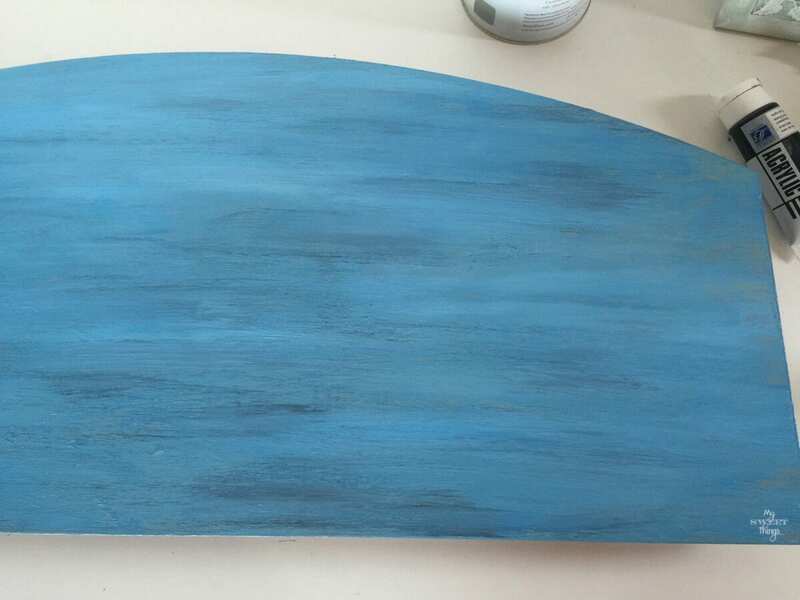 Then I applied a first coat of DIY chalk paint in a grayish color and let it dry. I took an old container and mixed some blue and white. By leaving it “half mixed” it’s easier to show different shades of colors. I wanted more contrast, so to the remaining paint I still had I added a drop of black acrylic paint and mixed again. I designed a stencil with my Cameo, taped it in place and painted it white. 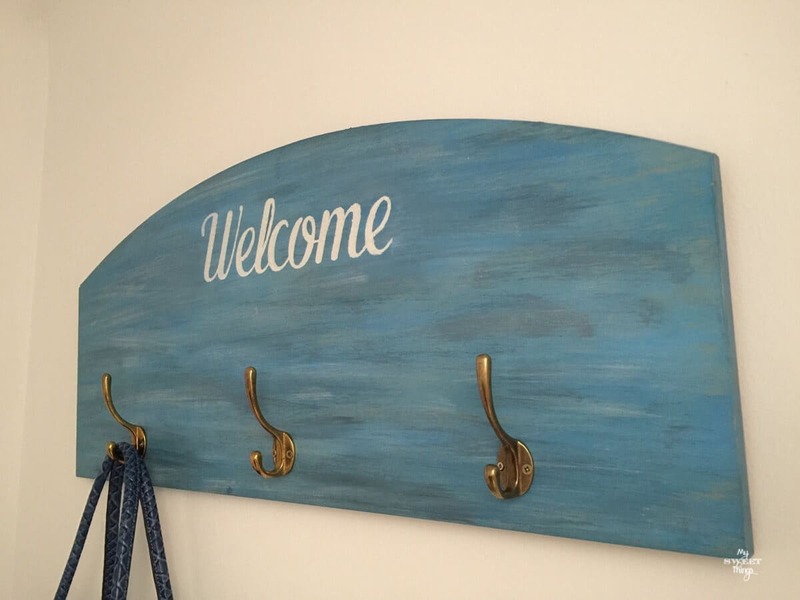 It was time to add the hooks, and I found some pretty brass ones that look terrific with the blue paint. Here’s the finished wall hanger. Here’s the wall hanger in its new place, I will show you soon the rest of the things I did for this foyer. 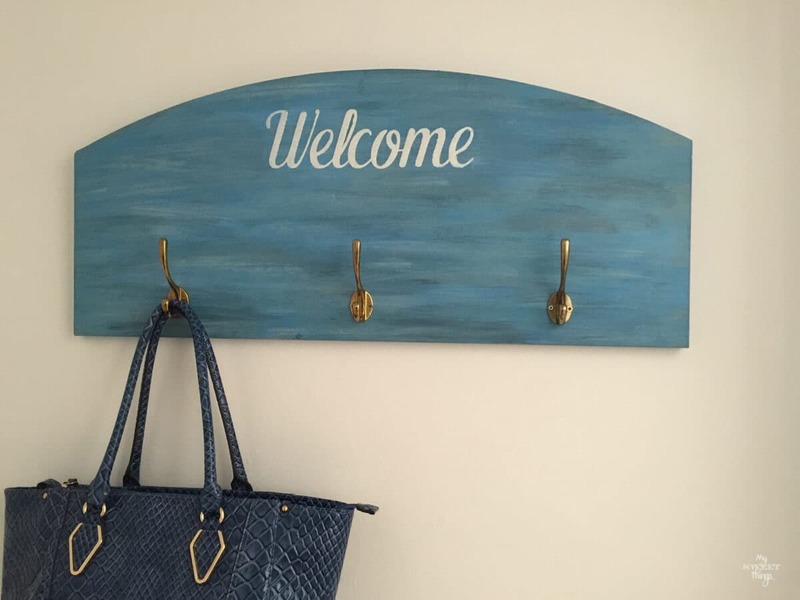 I’m in love with the wall hanger and I’m glad I stopped at the thrift store to have a look. Every single piece can have a new life! 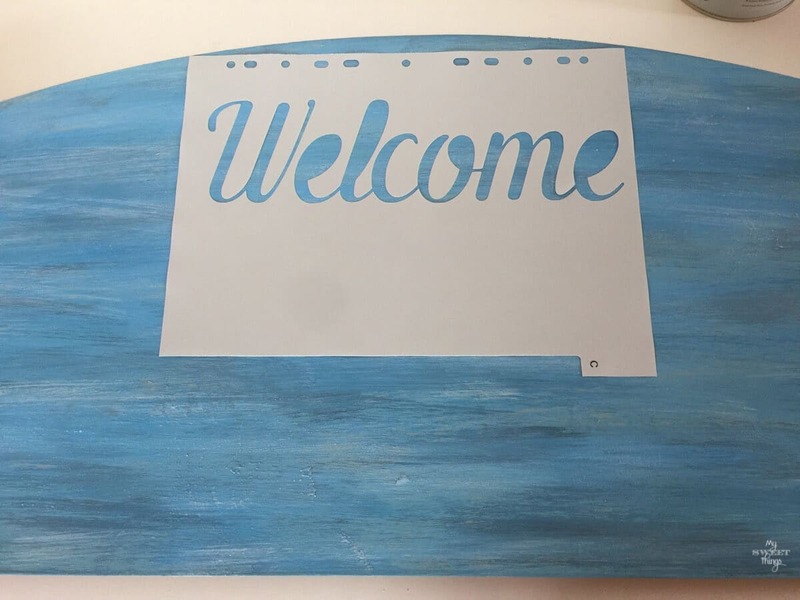 This entry was posted in Before & After and tagged Before & After, Chalk Paint, Decor, DIY, home decor, Paint, Recycle, Scrap wood, Stencil, Wall Hanger, wood. Beautiful Pili. I love h ow you blended the colors and make it look like it has depth and dimension. Now you have the perfect place to hang up your things. Thanks Mary! It seems that summer inspires me, now I want to try more things. This is so pretty now! You are so talented, and I love how you painted this piece. Thank you so much, Sherry! I came up with that technique by accident one day, but it turned out really cool on this piece. 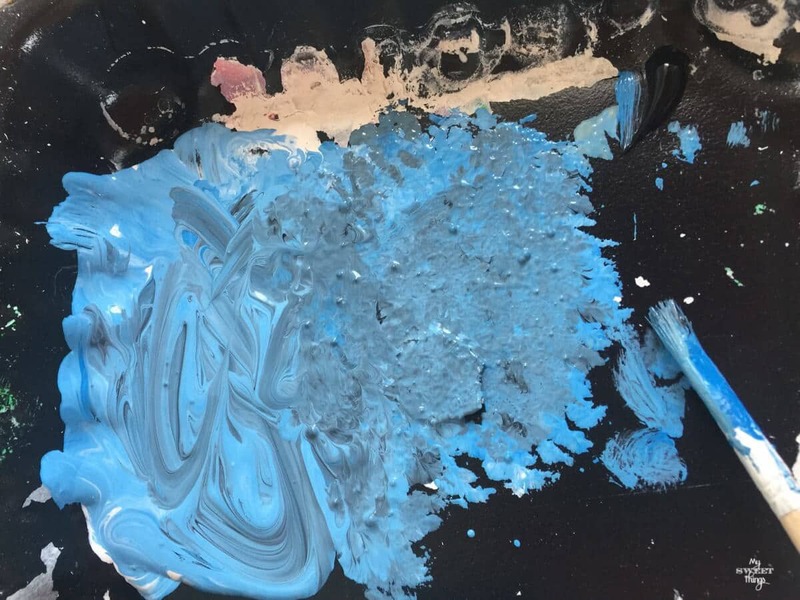 I love your painting technique on this-so pretty! What a great piece! The paint on the shelf is so pretty and has so much depth with the addition of black paint. I feel your pain with not being able to buy everything you come across–my husband and I are planning to move soon so I’ve put myself on lockdown on buying new things. Especially big items! Good luck on your move, I don’t want to remember mine! If I have to move again I think I will convert myself into a minimalist style. 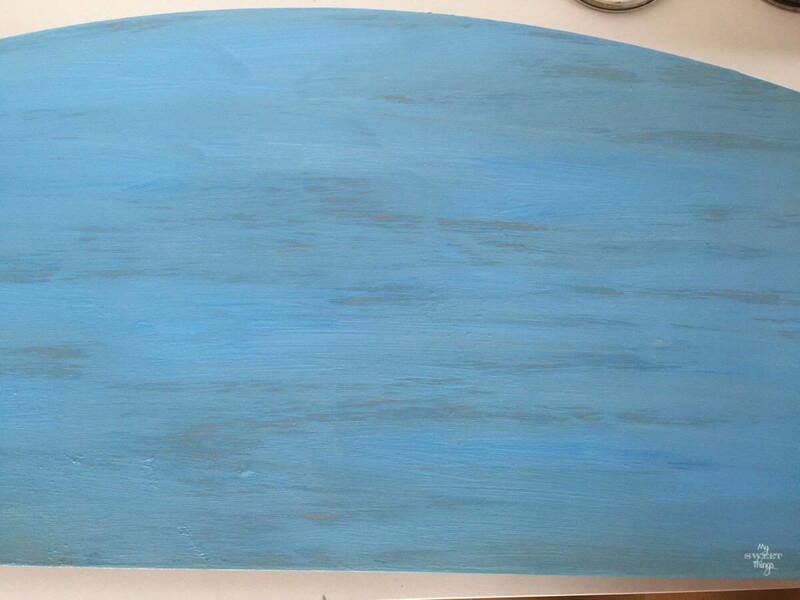 LOVE that blue color! Looks so perfect on your wall …. beautiful! I love that color too! It is even prettier when you see it live. 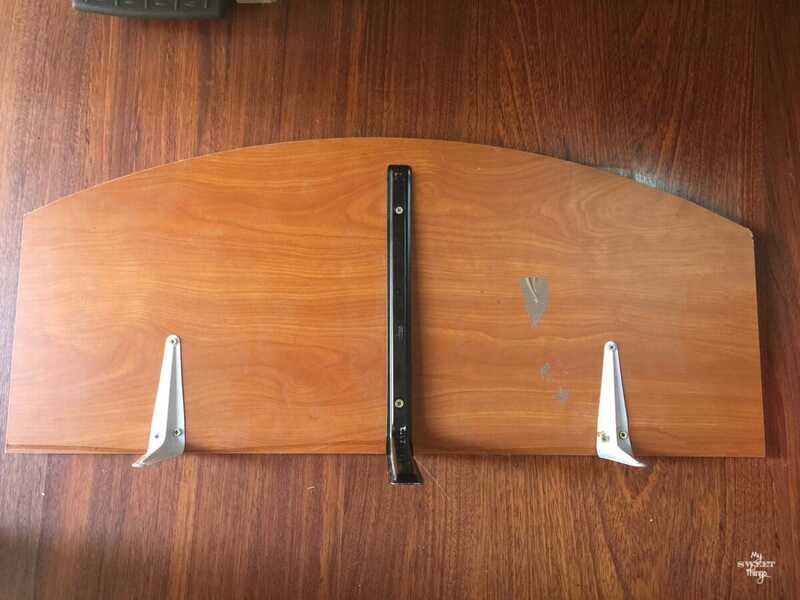 The shelf turned hanger is so pretty. 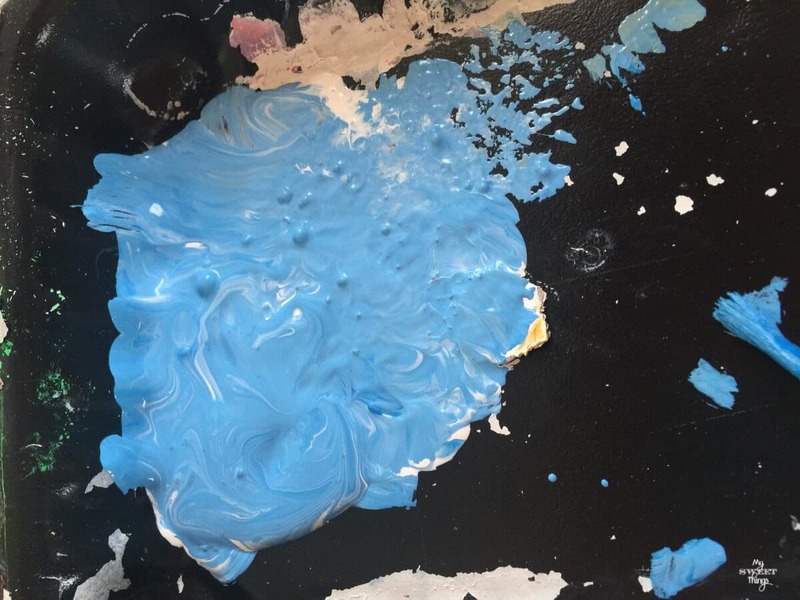 I love the color you chose and how you blended the paint. I bet you have found a new favorite store. Yes Debra, I found a new favorite store. Now I have to sell some of the things I have here so I can go again and have another look. I love what you achieved with your paint technique! I’m going to have to try that. Love how your shelf turned out. It’s always nice to make friends with the lady at the thrift store! Great find! You did a beautiful job. 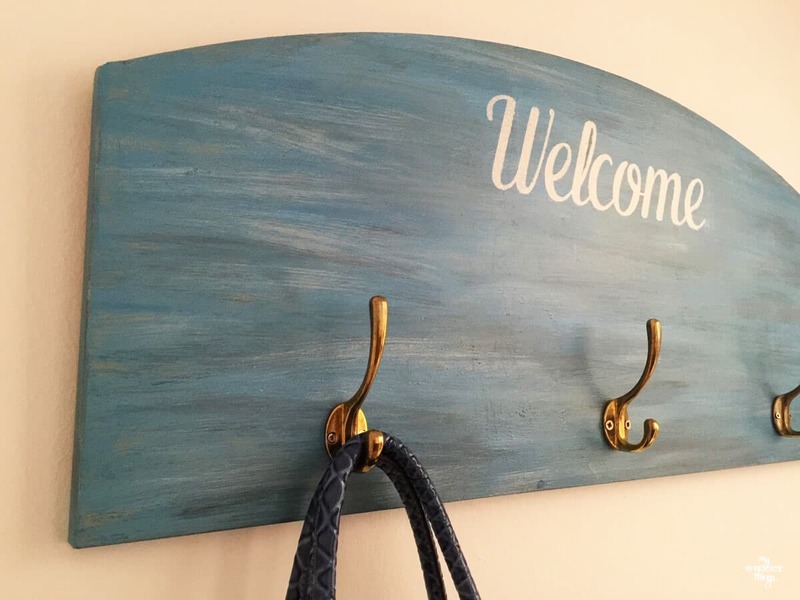 Love that blue and it looks so perfect with the brass hooks!! P.S It must be so frustrating only buying one especially when there were so many nice things. Perhaps she’ll consider an exchange program? Thanks, Michelle, I like those shades of blue too. Seeing it again makes me feel like doing one for us too. 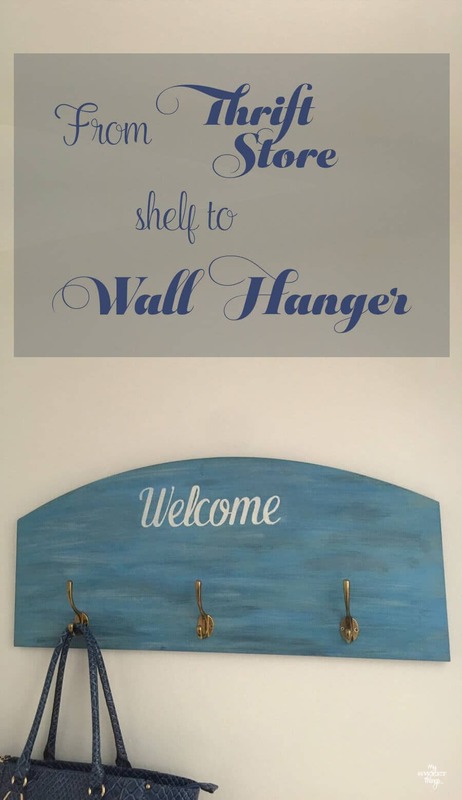 Great shelf repurpose, Pili and I love the color you painted your wall hook hanger! 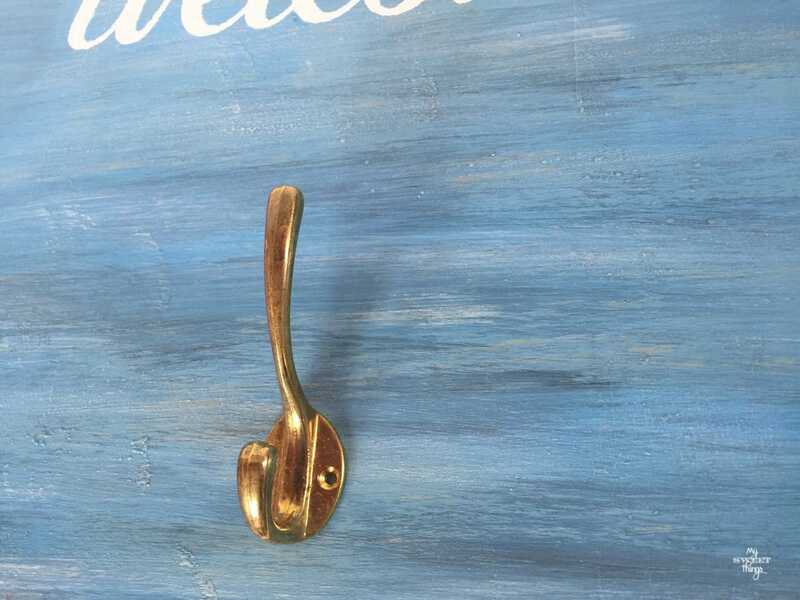 Pili, love this wall hanger! It looks great in its new home. You did a wonderful job! I like the different colors you mixed to paint the sign with, it gives it a unique and awesome look! Many thanks, Keri. When the owner came to the apartment and saw it, she fell in love with it and I was so happy. Thank you so much. As you see it was really easy to make! I would love to see yours if you decide to make your own.